A paramedic who took selfies with dying emergency patients has been fired by health authorities in central Russia. 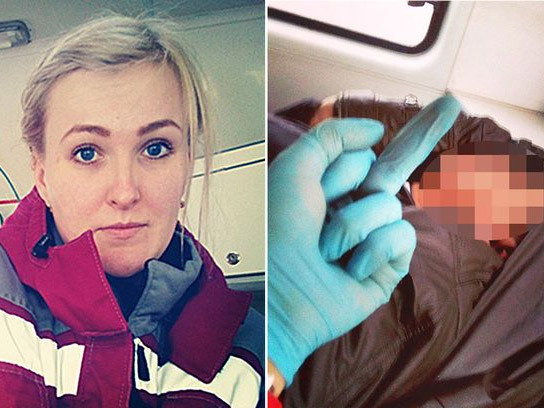 Tatiana Kulikova placed a series of gruesome photos on local social media, taken while she was on duty in an ambulance in Kirov. In one photo she’s pointing at an accident victim and the caption reads, “Another moron.” In another selfie, in which she’s holding up two fingers at a heart-attack victim, the title is, “How I hate my job.” The city’s emergency services fired the twisted health worker after she admitted taking the photos. Kulikova’s shocking selfies made local inhabitants angry because members of their families appeared in her gruesome gallery.